When the programmed speed limit is reached, pressing the accelerator pedal no longer has any effect. it requires a programmed speed of at least 20 mph (30 km/h). The programmed speed can be exceeded temporarily by pressing the accelerator firmly. 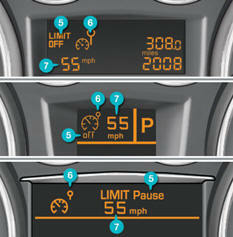 the speed limiter mode is selected but is not switched on (OFF). Switch the speed limiter off by pressing button 4 : the display confirms that it has been switched off (OFF). 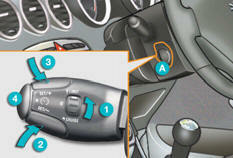 Turn dial 1 to the "0" position: the speed limiter mode is deselected. The display returns to the distance recorder.